I arrived at night to the mountainside hotel part of a group of hotels, cottages and flophouses offering a view of the mountains. The hilltop was dimly lit by candle light from the restaurants and the safety light in each unit. Chabad managed to find me in the dim lit street within an hour, a bachur on a motorcycle pulled up and asked in Hebrew “Where in Israel was I from” I answered “New Jersey.” He invited me for Shabbat and then hurried over a few yards to catch the nonstop stream of Israelis headed to their flophouse. Each one brushed him off and said they were not interested; they repeated they were not interested in anything. I was on the Hummas trail and this was one of their comfy hangouts. Everywhere I had been until now was off the Israeli trail. INDIA – It’s 10:30 A.M. at the Pink House in Vatta Kanal – go straight along the road after Chabad House and bear right near the top of the hill – and 10 Israelis are starting the day with a bong on the porch. Someone asks about the chillum – a clay pipe for smoking which is very popular in India – and everyone is feeling blue because the mushrooms, unfortunately, are no longer in season. The new Israeli colony has injected vast amounts of money in local terms and provides a living for owners of guest houses and kiosks, taxi drivers – and, of course, drug dealers. “Israeli food” accounts for 80 percent of the menus in the local restaurants; Indian food has been displaced by shakshuka, laffa and sabikh. The transformation of a small village in India into an Israeli zula (comfy hangout) is a direct result of the abandonment of the basic motivation of generations of backpackers- These days, young Israelis go to India to do drugs with other Israelis against the backdrop of a shifting landscape. The result is the “Hummus Trail” – a chain of laid-back refuges in which the sacred tongue rules in loud tones and the de rigueur item of clothing is a T-shirt signifying the conclusion of an army training course. Dialogue with the locals, when it takes place at all, is confined to “I’d like some chai” or similar commands. “Do you think I could deal with the Indians when I’m sahit [not stoned]?” says A., a 21-year-old woman from Kfar Sava, who has been in Vatta for two weeks, when asked whether she has spent even one day in the country without drugs. Already in 2006, Elhanan Nir published a work Me-Hodu ṿe-ʻad kan : hogim Yiśreʼelim kotvim ʻal Hodu ṿe-Yahadut shelahem documenting the Israeli pilgrimage to India, but except for one or two academics mentioned in the book the conclusion was that the Israeli don’t really engage Indian culture or Indian religion. In a café in town, there were signs in Hebrew to use your skills learned in India and come work with the Bnai Menashe upon returning to Israel. Also a sign from Yisrael Batenu, who maintain a series of outposts in india. I have been told that Bnai Akiva is also active in some cities. When I asked Israelis what struck them about Hinduism, I usually got the Sikh Golden Temple in Amritsar as the first answer, with a follow-up that they did not know the imageless monotheistic Sikhs were theologically closer to Islam. As a follow-up, those asked tended to answer something about Buddhism. But mainly it did not interest them. 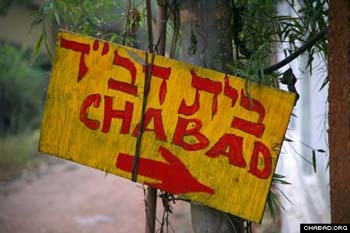 The Chabad house of Rishikesh is what’s called a mushroom, a non-official Chabad house. The Chabad houses on chabad.org are officially under Krinsky while those elsewhere are separately organized, originally more messianic, and are on Chabadhodu.org. There is a rabbi there who has been there for ten years and impressed me for his sense of the reality of the situation. His two young assistants less so. The first got up and was pouring large amounts of Vodka and told wild extemporaneous miracle tales with details that exhibited his lack of education such as a person going to Malaysia to study Hindu meditation (it is a Muslim country), or a story of a person going to the city of Tazmania where a visiting secular Israeli became the only one who remembered the order of the prayers, or the miracle that the Rebbe could stand for so long greeting people. The other bacher lead davening with frequent interruptions in his davening to tell jokes or sing alternate songs with a stoned Israeli. The bencher had the song mentioned in the Haaretz article above “I tried mediation, Goa,movies et al. and in the end my soul craved Torah and I bought tefillin and became a baal teshuah.” It also had a song about being in the Israeli army envious of one’s officer, but he got killed so I am the lucky one, yechi for my life, yechi for the rebbe. The shaliach said that he has to be realistic and use the leniencies he can to live and work here. He has learned a lot from and relies on the leniencies from the Yeshivat Othniel, Tekoa, and Mekhon Herzog world. He knew their leniencies about entering Sikh Gurdwaras. And here where every day is a holiday he relies on the position of tosafot that “they are only doing the custom of their forefathers.” Yet, he know that in a city like Varanasi, they have an unbroken tradition of understanding of the ritual. He knows something of the leniency about Ashrams, but wanted to know more. He did not know the teshuvah of Rabbi David Hayyim Halevi permitting TM style meditation. In general, he relied on the Rebbe to acknowledge that Indian wisdom is subtle and that there is what to learn but that he sticks to Rabbi Yitzchak Ginzburgh (and he volunteered to say, despite the political problems). The Shaliach gave an appropriate dvar Torah based on the Magid of Mezritch that originally all is divine and God converts the Nothing (Eyn) of the world into Something (yesh) by the act of creation. And the zaddik converts the yesh back to the eyn by his worship. Hence, you will reach Eyn here. Through Torah uMizvot. As he finished, I could not help thinking that in three months of chulent, heavy vodka drinking, and wearing tefillin, the adept would not have reach anywhere near the level of three months in an ashram. Empirically, those in the Ashram would have more mind control toward Eyn. Which reopens up the question that people used to ask: Should Judaism have opened up an ashram? I know people in the 1990’s who thought of it. In the Jewish ashram, you would practice solitude –hitboddedut, study Ramchal, CHabad, Nefesh Hahayim and Ramak, engage in the path of Hayyim Vital’s Shaarei Kedushah or that of Ovadiah ben Avraham ben haRambam. It would also mix in some Rav Nachman calling out to God with an awesome Kabbalah Shabbat. Meaning that the Yeshiva Ashram would only teach and practice the Raja Yogic and Vedanta, and Advaitan parts of Judaism. It would leave all the karma yoga of practice, halakhah, and the study of the laws for the advanced students. Just like the Ashram does not teach its strict vegetarian dietary laws or its Hindu rules and does not worry the students about studying them, even as it practices them. Maybe for certain souls this approach would be better for their souls. The mainstream of Jewish outreach has trouble understanding the basic difference between the spiritual states of raja yoga and Vedanta from the action based karma yoga of mizvot. There is an online guide to rating gurus based on their empirical ability to help you achieve spiritual goals. In it, they also include the Rebbe giving him a half star out of five stars for the ability to help you spiritually. Seventh Lub Reb, son-in-law of 6th. “The Master Plan of Creation” page begins: “It is no accident that you picked to read this item. Nothing that happens in our lives is mere circumstance or coincidence.” Org = Chabad. Apocalyptic extreme right-wing Jewish Hassidic fundamentalist. 613 commandments, lots of morality. Anyone for fire and brimstone? But maybe we should say Torah uMitzvot have nothing to do with gurus. There is a contemporary philosopher of religion Mark Heim who in his innovative book Salvations who criticizes the pluralistic approach that all religions are pluralistically the same. No, rather they are different and maybe offering different goals and ends. There are not only various religions but various kinds of religions, sometimes completely at odds with each other, totally incompatible. And this will in turn lead us to discover that these religions have their own religious goal or religious end. The meaning of salvation actually varies from one to the other. Mizvot and Yoga may be completely different and not even have functional equivalence so there is no competition. Maybe instead of seeing Torah and Yoga as an either/or of two religious paths, we should see them as either having nothing in common with each other or having potential for a synthesis like Torah with most of the humanities. Just say that “there is wisdom among the gentiles” and treat Yoga as a form of wisdom. Yoga should be returned to its secular role as a physical discipline like tai chi or karate. But we should call it asanas (physical positions) not the broader name Yoga. We should accept the Hindu’s complaint about not calling it TorahYoga or those Americans who say Yoga is not Hindu. But we are only doing the physical elements as they have evolved in the 20th century, the asanas. – see here for links to our prior discussions. There are two paths in Hinduism, as it is practiced, the life of the householder and the life of the holy man. The householder focuses on ritual, holidays, and worship. The holy man tradition sees himself as above the practices of the householder and does not practice them. The Swamis of Rishikesh will tell you to avoid the street Hinduism and festivals since they distract from the Yogic practice. One can be in an Ashram and never learn anything about householder Hinduism or the gods. Yoga as taught in Rishikesh is not directly connected to ritual Hinduism or worship even in India, except at the ritual at the end of the training course that takes most of the participants by surprise. It is however connected to the Yoga Sutra and Advaitan thought about non-duality, and the Oneness of Being. I know many Jews in America and Israel who would like a Jewish guide of what is similar to our tradition in Ergas, Ramhal, Chabad, and Nefesh Hahayim and what is not similar or what is the dividing line. But we have a new problem of those American Yoga teachers from Bayonne or Calabasas, we bring back a random assortment of statues for their studios. They freely pick souvenir statues of Buddha or Hindu deities to decorate their studies. Real Hindu divine images need consecration, an altar, and daily service. These, rather, are part of the eclecticism of the US. They also make up new age narratives such “We are now going to worship the Sun by doing the Sun salutation.” So participants think that they are about to worship an ancient Hindu deity when they are not. Then American newspapers debate these things without checking with the original practice. At the table at the Chabad house, there were also couples from the Othniel, Tekoa, Gush world who were not looking to the Chabad rabbi, rather they talked between themselves. They were simultaneously committed Jews and incorporating their experiences of India. They are the ones who will most need a guide to Indian wisdom and the one’s most needing to write one. A painted Sadhu, a man who renounced his possessions to live a life of poverty, stops me for a conversation in hope of receiving money. I stop because I am drawn to watch the wild monkey that he befriended who is politely sitting next to him without grabbing anything. He tells me about his relatives in Buffalo, and their prosperity, how they got a green card, and why he prefers his possession-less life. Over the course of several days I hear much from the simplest locals about their connections to the US or Australia. Rather than isolated figures who do not know of the wider world, now even those in exotic locations are on some of the new routes of globalization. Rishikesh is one of those off-beat globalization hubs as the world’s capital of Yoga and most of those who currently teach Yoga seek to spend time in the city perfecting the craft. Hence, the recent return of elements of Hindu devotional practice into American Yoga. Rishikesh in the Indian state Uttarakhand, about 45 minutes by plane north of Delhi, located in the foothills of the Himalayas. The name Rishikesh is loosely applied to an association of five distinct sections encompassing not only the town but also hamlets and settlements on both sides of the river Ganges. Three of the sections are for tourists, one is the old ashram hub and there are also several parts on the mountainside itself beyond city lines. Rishikesh is home to the 133 year old Kailash Ashram dedicated to the traditional Vedantic Studies. Prominent personalities such as Swami Vivekananda, Swami Rama Tirtha and Swami Shivananda have studied in this institution. In the 1920’s and 1930’s, aspiring swamis practiced their attainments in this isolated spot, north of well-known holy city of Haridwar. In the 1940’s they start the modern Yoga movements. In 1934, Swami Asuri Kapila established the the Ramana Ashram and the International School of Yoga in Montevideo, Uruguay. Swami Asuri Kapila wrote to his friend, Swami Sivananda (Rishikesh, India), to promote the organization of yoga all over the World, and proposed the creation of the International Yoga Federation. In 1947, Swami Sivananda established the World Sadhus Federation and in 1948 following the example founded the Yoga Vedanta Forest Academy, to train yoga teachers and swamis. These Swami are important because they took their traditional ascetic education and created a Modern Hinduism in the 1940’s to 1970’s. They took out the superstition, the anti-scientific, and any remaining polytheism. They created in their own words a scientific form of body control along with breath techniques and mind enhancement. Yoga was no longer an ascesis to reach beyond rather an ideal form of integrated life. They taught Yoga as a psychology and fitness, leaving out the Brahmin Hinduism and even leaving out the tadtional commentaries on the Yoga Sutra. Swami Shivananda and his student Swami Vishnu-Devananda set up camps, modeled like summer camp, in the Laurentians outside of Montreal and another in the Bahamas. George Harrison discovered the latter while filming HELP! and the rest is history. Along with their wives, girlfriends, assistants and numerous reporters, the Beatles arrived in India in February 1968, and joined the group of 60 people who were training to be TM teachers including musicians Donovan, Mike Love of the Beach Boys, and flautist Paul Horn. While there, John Lennon, Paul McCartney and George Harrison wrote many songs and Ringo Starr wrote his first. Eighteen of those songs were recorded for The Beatles (the White Album), two songs appeared on the Abbey Road album, and others were used for various solo projects. 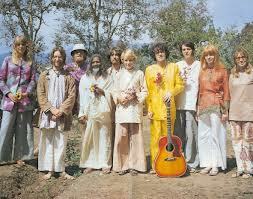 Starr and his wife left on 1 March, after a ten-day stay; the McCartneys left after one month due to other commitments; while John Lennon and George Harrison stayed about six weeks and left abruptly following financial disagreements and rumors of inappropriate behavior by the Maharishi. Also there at the same time were Mia Farrow (who had recently divorced Frank Sinatra), her sister Prudence and brother John, Donovan, Gyp “Gypsy Dave” Mills, Mike Love, jazz flautist Paul Horn, journalist Lewis H. Lapham, film-maker Paul Saltzman, socialite Nancy Cooke de Herrera, actors Tom Simcox and Jerry Stovin, and dozens of other, all Europeans or Americans. Lennon, who had thought of bringing Yoko Ono, decided against it. Donovan taught Lennon a guitar finger-picking technique that he passed on to Harrison. The technique was subsequently implemented by Lennon on the Beatles’ songs “Julia” and “Dear Prudence”. The latter was composed by Lennon to lure Prudence Farrow out of her intense meditation. Both Lennon and McCartney often spent time composing rather than meditating, and even Starr wrote a song, “Don’t Pass Me By”, which was his first solo composition. 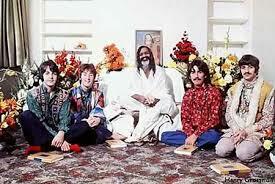 The group violated the ashrams rules by doing much LSD and Hash. One evening, when the moon was full, the Maharishi arranged for everyone to cruise on the Ganges in two barges. The trip started with the chanting of Vedas by two pandits, but soon the musicians brought out their instruments. The Beatles sang Donovan’s songs, while Love and Donovan sang Beatles’ songs, and Horn played flute. Currently, it is a wonderful vacation town. It is as if Rhinebeck, Woodstock, and New Hope-were all combined into a bigger town and everything is inexpensive so that you are staying at least a week or two. The town is surrounded by the beautiful foothills of the Himalayans. They have western style bakeries and coffee shops for a croissant and a French Press coffee. And coming from Varanasi, it is not that religious of a town in the tourist parts since meat and alcohol are served just over the town line. The tourist parts have more of a new age and Buddhist feel than Hinduism, and they offer river rafting, bungee jumping, and motorbike tours. A full hour massage with a trained masseuse is $8:50 and you can pick your style of message or special needs. Following the path of the Beatles there are two paths in his town: the Yogic OR the hanging out writing poetry and playing music. Yoga is everywhere here. Every hotel has classes in asanas, the yoga postures. Some also offer meditation, pranayamas (breathing styles). Now Yoga is currently not about the ascetic training of the body, rather 40 positions combined with meditation, breathing and some Vedanta-Advaitan non-duality. Some go full time to Ashrams, other try a one week intro course and then sign up for a two week teacher’s training program. Some go to high priced Yoga training in exclusive spas. The book stores have the new age best sellers like Eckhart Tolle, all the American yoga books, and books about Buddhism. These attendees at the yoga training workshops will go back to the home towns and teach Yoga. What about those who are there for the music, drugs, and poetry? That will be covered in the next post on the Israelis in town. In January the spring semester starts here at Banares Hindu University. As part of the Master’s program there is a requirement to have several weeks on Judaism, Christianity, and Islam. The person who taught the course in recent years is on Sabbatical, so I asked the person who will be teaching it this January -how Judaism will be covered? He answered that he will focus on “I am that I am” [Exodus 3:14] as showing that God is ultimate Brahman, that only Moses was the realized being who attained this insight therefore the Israelites will accept him, and that unfortunately Judaism does not teach that the goal of the soul should be to identify and merge with this “I am.” He will also teach about the names of God and those that can still be pronounced and those that cannot be pronounced. His source is Ramana Maharshi. Since I will teach part of this class- Where should I cover? Where do I begin? Questioner: Is the thought “I am God” or “I am the Supreme Being” helpful? Ramana Maharshi (1879–1950) is one of the outstanding Indian gurus of modern times. At the age of sixteen, he lost his sense of individual selfhood, an awakening which he later recognized as enlightenment.In response to questions on self-liberation and the classic texts on Yoga and Vedanta, Ramana recommended self-enquiry as the principal way to awaken to the “I-I”,realising the Self and attaining liberation. He also recommended Bhakti, and gave his approval to a variety of paths and practices. Paul Brunton, Carl Jung and Heinrich Zimmer were among the first westerners to pick up Ramana’s teachings. In some of the following quotes Ramana Maharshi is simply called “Bhagavan” – “his divinity.” The discussion below relies on both direct quotes and discussion by David Goldman, a leading authority of Ramana Maharshi. Ramana Maharshi often cited the Bible, and in particular the statement ‘I am that I am’, to support his contention that God’s real nature was ‘I am’. ‘I am’ is the name of God. Of all the definitions of God, none is so well put as the biblical statement ‘I am that I am’ in Exodus chapter three. There are other statements such as brahmavaiham [Brahman am I], aham brahmasmi [I am Brahman] and soham [I am He]. But none is so direct as Jehovah [which means] ‘I am’. The essence of mind is only awareness or consciousness. When the ego, however, dominates it, it functions as the reasoning, thinking or sensing faculty. The cosmic mind, being not limited by the ego, has nothing separate from itself and is therefore only aware. That is what the Bible means by ‘I am that I am’. M.: The Self is known to everyone but not clearly. You always exist. The Be-ing is the Self. `I am’ is the name of God. Of all the definitions of God, none is indeed so well put as the Biblical statement “I AM THAT I AM” in EXODUS (Chap. 3). God says “I AM before Abraham.” He does not say “I was” but “I Am’ (Talks, 408). The Cosmic Mind, being not limited by the ego, has nothing separate from itself and is therefore only aware. This is what the Bible means by ‘I am that I am’ (Reflections, 111). “I am that I AM” and “Be still and know that I am God.” (Talks, 307). M. Yes, He is always the first person, the I, ever standing before you.Because you give precedence to worldly things, God appears to have receded to the background. If you give up all else and seek Him alone, He alone will remain as the I, the Self (Maharshi’s Gospel, 55). Ramana refers to prayer. He says that Western thinkers pray to God and finish with “Thy Will be done!” He comments that it is better to remain silent: If His Will be done why do they pray at all? It is true that the Divine Will prevails at all times and under all circumstances. The individuals cannot act of their own accord. Recognize the force of the Divine Will and keep quiet (Talks, 546). Kabbalistic ideas on creation are also derived from their conception of God as ‘I am’. In the Jewish tradition creation occurs by the utterance of a single word. The word is the first of all sounds to be heard in manifest existence, and thus parallels the Hindu conception of Om. For the Kabbalists this word is none other than the supreme name of God, ‘Eyheh’, ‘I am’. The only Jews who used God’s revelation of Himself as ‘I am’ to develop both a theology of God and a spiritual practice through which He might be directly experienced were groups of mystics who followed a tradition known as Kabbala. (10) They evolved intricate cosmologies, deriving them from a mystical exegesis of Old Testament texts, and broke with traditional Judaic thought by proclaiming that man could approach YHWH and in His presence commune with His beingness. In one interesting practice, which parallels Hindu sadhanas, Kabbalists split the name Yahweh into two components and invoke ‘Yah’ with the incoming breath and ‘weh’ with the outgoing breath in an attempt to be continuously mindful of the reality that the name signifies. If one paraphrases Psalm 46, verse 10, to bring out more fully the meaning that Bhagavan attributed to it, it would say, ‘Reach the state of pure being and absolute stillness in which the mind is destroyed and one will then experience directly that God is ”I am”’. Bhagavan often stressed that in order to ‘Be still and know that I am God’ one must be totally free from thought, even the thought ‘I am God’. After citing this biblical quote he once added, ‘To be still is not to think. Know and not think is the word. '(28) And on another occasion: ‘One should not think ”I am this – I am not that”. To say ”this” or ”that” is wrong. They are also limitations. Only ”I am” is the truth. Silence is ”I”. '(29) ‘Being still’, according to Bhagavan, requires no thinking and no assertions. On the contrary, it requires a complete absence of both. Hear O Israel: the Lord our God is one Lord;And you shall love the Lord your God with all your heart, and with all your soul and with all your might. Once one knows that Yahweh denotes God as ‘I am’, That is to say, both Moses… were saying, indirectly, that heart, soul and mind must be directed exclusively and lovingly towards the ‘I am’ that is God. In fulfillment of this command, orthodox Jews attend their synagogues wearing phylacteries on their foreheads and hands that contain copies of these verses from Deuteronomy. They also have copies in special containers that are attached to their door and gateposts. Some devout Jews even kiss the container reverently each time they enter and leave as a gesture of respect towards Yahweh, the one God who revealed Himself to Moses as ‘I am’. Verse four in particular is the greatest and most widespread affirmation of faith for all Jews. Whatever their mother tongue, and irrespective of what country they live in, all practicing Jews regularly recite verse four in the original biblical Hebrew. Israelis are flocking to India by the tens of thousands, about fifty thousand a year. Rabbi Yitzchak Ginsburgh addresses the issue in a surprisingly decent way. He assumes that those seeking are sincere seekers and if they had been more connected to the religious establishment then they would have not gone seeking, thereby losing their ability to attain higher gifts. For Ginsburgh, India is a place of spiritual gifts; he relies on the story of the gifts to Abraham’s concubines from Jubilees, Zohar, and Menasheh ben Israel. Ginsburgh acknowledges that travel is good, but beyond spatial travel -thinking is the best way to travel -such as to the heikhalot and pardes. On meditation, hitbonenut- he switches topics by the vague use of the word meditation in English. Indian meditation is to tune out the senses (pratyahara), focus on a single point (dhyana), and then mentally become one with it (samadhi). To think about divine wisdom, the soul, or contemplating an idea is either the path of jnana yoga- the contemplative path or if chanting divine names it is more devotional bhakhti. If he is referring to using a mantra as a focus point (dhyana) that is not contemplation of theology. Ginsburgh acknowledges the Advaitan philosophy that everything is one and divine but presents it in the name of the Besht. Yet he misunderstands Hinduism by thinking that Hindus worship the cow and nature because God is in all. It is like saying Jews worship the tefilin because of the lower unity. In actually, the Yogic-Advaitan Vedanta philosophy just like Chabad distinguishes between the discussion of unity in Shaar Hayihud and the light in mizvot in the Tanya.Jews put on tefillin to receive the light and blessing and Advaitan’s worship the Ganges as a source of blessing to the world. This would be a good point for a serious encounter or discussion. And like Chabad, the Yogic-Advaitan approach rejects the semi-dualistic approach of Ramanujan or God entering to save the world. In his discussion of mantras, he says the Indian one lead to colorful and interesting place but are not real but that is exactly what it says in Yogic works about other approaches to meditation and it would certainly apply to Jewish prayer. For the yogis, if it does not and cannot reach Samadhi, the overcoming of duality, then it is is only colorful and interesting. Ginsburgh’s criteria is less about training and more that the other approaches are not for the Jewish soul. Learning Kabbalah and Chasidut ought to always involve hitbonenut (the process of self-reflection using the power of bina, understanding). Jewish meditation does not involve repeating a mantra a million times. Rather, it involves looking into an idea, in order to enter it deeply, connect to it, and make a spiritual unification between the light of the idea (and the G-dly life force which creates it) and one’s soul. Everything we read and think ought to be done through hitbonenut, or Chasidic meditation. What motivates a person to travel? The word tiyul [trip] comes from the Talmud. Tiyul b’pardes is not aphysical trip. It refers to a trip to upper words, to find the secrets of Torah, to find the Master of the World and the secret of how He creates the world and my soul; to see in detail Who He is, What he is, and to recognize my relationship to Him. The sages mention tayalim. Tayalim are those who make unifications…they don’t need to work. All they do is travel; they make unifications. It’s a very high level. Hodu (the Hebrew word for India) means “Give thanks”, which is, indeed, a very Jewish concept. The entire difference between an Indian (Hodi) and a Jew (Yehudi) is just the letter, yud at the beginning. An Indian is close to a Jew. Sometimes a Jew has the yud [the essential point of connection] but is missing the hodi (acknowledgement), and he or she needs to go to India to find it. מצולה ביוון טבעתי “I have drowned in yevain metzula, the depths, of logic and nature.”(Psalms, ch. 69) Yevain also spells Yavan, Greece. Whoever learns the dualistic philosophy of Greece, which deals only in natural forces, is liable to drown in the depths [of belief in nature/science alone]. But G-d gives us a way out of this. The hint is that in order to emerge unscathed, one must elevate and transform Greek wisdom. When we say that there is a revelation of the yechida in the soul, that “G-d is All and All is G-d”, this is a revelation of the Essence of G-d Himself, so to speak. This two-part formulation was originated by the Baal Shem Tov. The concept exists in a hidden manner within the Kabbalah, but the Baal Shem Tov revealed it. Each side of the paradox contradicts the other. To say G-d is All means there’s no world. This contradicts the previous statement that “All is G-d”, where each second I feel that all, including myself, is coming into being, out of absolute nothingness. Every moment, there’s G-d, the Creator, and we, who are being created. It’s not a duality, where G-d enters a ready-made world to rule, supervise and bestow good. To say that nothing can lift its hand on its own without the help of G-d is this first level [G-d is All], the צ of צלם. Yet, to say only that “G-d is All” would imply the world itself doesn’t exist; it leads to viewing the world as an illusion. That sounds rather like an Indian belief, wherein only one side of the paradox is emphasized. This is an imbalanced perception that sees only a partial truth, and which certainly ends up degenerating into idolatrous practice and philosophy. All idolatrous religions, especially those of India, emerged out of split thinking. They err in an extreme way toward one or another partial conception. So, immediately, in response to the error, we say,“No! All is G-d!” Each of the phrases contradicts the other. One side of the sentence says that G-d creates the world every moment. The other side says, “there is no world.” A mistake in one part generates a mistake in the other part. In saying only “All is God” by itself, divorced from the other half (“G-d is All”) one can mistakenly come to identify the world itself with G-d—to the extent that one can, G-d forbid, bow to idols or cows. In this generation, there are many Jews travelling to India. Most Jews today, by Divine providence, have not been raised to learn Torah, have not been educated with a consciousness of Judaism. They have not been raised as the tzadik of the צלם. Why is this? But this is the crucial point. If everyone were to be born into an observant environment, who knows whether they would ever awaken to the higher levels, to reach for the shadows? Almost certainly, those born with the tsadik of the צלם would be content to remain at their current level (on the level of צ), and not grow toward the ל and ם of the צלם. The secret of צלם, the Divine image in which Adam has been created. Unconsciously, a traveler seeks his shadow, so he comes to a place where he can admit to its existence. One of the best places to find it is in Hodu, India. Everything in the world has a צל. But a Jew has an additional shadow–an additional צל, or ם -צל indicated by the final Mem ם. The צלם is thus a shade on a shade [called bavua d’bavua]. Only in kedusha do we have this. Accordingly, it says that the three letters of צלם are three levels of heart: heart within heart within heart. One of the first kabbalists, who lived a thousand years ago, was Rabbi Abraham Abulafia. He wrote (in his book The Form of the Jewish Heart ) about 2 lameds which face each other and join to form a Jewish heart. When you set out to learn meditation, be aware that Jewish meditation is completely different than Eastern meditation. Jews don’t recite a mantra a million times. A mantra may bring a person into a colorful and interesting world. Yet it isn’t the true path for a Jew. It brings one into an imaginary dimension, and sullies the neshama. אחד ה-הוי אלוקינו. When Jews repeat a Torah verse, it’s not just about the sound, it is about the inner content. Different tzaddikim had special verses which they would repeat. The famed Rabbi Pinchas of Koretz, a student of the Baal Shem Tov, whose main life-lesson was that we should not “kid” ourselves, used to repeat a sentence over and over and over, as he walked: אמת בדרך נחני, “Lead me in the path of Truth; lead me in the path of Truth”. Another famous tzadik, Rabbi David of Lelov (a student of the Maggid), would repeat: תשמרני “Guard me.” (In Yiddish: “hit mir op”) This would keep a coal of conscious connection and enthusiasm (esh kodesh אש קודש) burning for G-d, through the holy speech of the heart. So, “G-d created one thing opposite another”. On one hand we deny the approach which uses a mantra, and on the other hand, we affirm the power of holy speech. A word or a verse in Torah has infinite spiritual energy and potential for a person to connect to G-d. Read the rest here. I once gave a talk where I asked the audience: What do Heschel, Soloveitchik, and Pope John Paul II have in common? The answer is that they all used the writings of Max Scheler to defend in the modern world the role of sacred action. Heschel defended mizvot, Soloveitchik defended the halakhic man, and Pope John Paul II defended the prayer and sacraments. Scheler pointed toward the eternal nature in man that transcends the biological through the transformation process of religion on the self. Rabbi Shai Held in his new book Abraham Joshua Heschel: The Call of Transcendence deals with the role of self-transcendence, prayer, and mizvot in Heschel’s thought- so go buy it. Shai Held is Co-Founder, Dean and Chair in Jewish Thought at Mechon Hadar. Shai has a PhD in religion from Harvard; his main academic interests are in modern Jewish and Christian thought and in the history of Zionism. His book Abraham Joshua Heschel: The Call of Transcendence is a clear exposition of Heschel’s thought on these topic and Held, in a clear and readable manner, situates Heschel within contemporary theology and philosophy of religion. There is another answer to the question: What do Heschel, Soloveitchik, and Pope John Paul II have in common? (someone actually called it out in that lecture) They were all born in Poland. Heschel was raised as a potential rebbe in the center of Polish Jewish life and went off to study poetry, aesthetics, as well as philosophy. Heschel’s personality and writings dripped heavily with real Polisher chassidus- Kotzk, Gur, and Reb Zadok. Later, when he entered the modern world, Heschel shined best as a Kotzker prophet by rising to the occasion when situated next to spiritual figures such as Hillel Zeitlin, Cardinal Bea, Daniel Berrigan, or Martin Luther King. This work dries Heschel off from the Hasidic outbursts and pietistic unpredictability in a way that will allow him to be apart of contemporary discussions of what God wants from us and what it means to lead a God centered life in 21st century America. 1) What is the main theme of your new book? The core of my argument is that the theme that animates Heschel’s whole body of work, the thread that connects almost everything he wrote, is a preoccupation with self-transcendence. 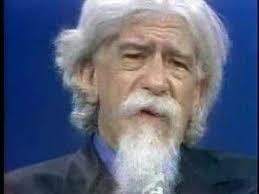 Self-transcendence, for Heschel, means that I really internalize that my ego is not the center of the universe. As he puts it, “Faith is the beginning of the end of egocentricity.” This notion of self-transcendence is closely connected to what Heschel calls “transitive concern” (as opposed to “reflexive concern”)– the care and concern that one manifests for other selves. You can’t live if you don’t have any concern for yourself, but you can’t be fully human, Heschel insists, if you care only for yourself. In the book, I show that for him self-transcendence is the highest spiritual level a human being can reach (what medieval philosophers would have called takhlit ma’alat ha-adam). The God of Tanakh, Heschel argues, is a God of transitive concern, a God who is beyond ego and who loves widows and orphans. Worshiping a self-transcendent God, we are (or ought to be) moved to strive for self-transcendence. Self-transcendence is key to Heschel’s understanding of just about everything that matters to him– the nature of the good, the nature of God, the meaning of revelation, the project of prayer and spirituality, and the meaning of fighting for justice on behalf of the weak and downtrodden. 2) What is Heschel’s greatest theological theme? He affirmed a God who is personal, who loves and cares, and whose love and concern extend to all of humanity.Sometimes Jews fall into the very dangerous trap of imagining God as just a big Jew. But the God of Tanakh is a universal God, even as He enters into a unique covenant with Israel. God cannot just be domesticated into a cosmic cheerleader for the Jews. By the way, this is an important point of contact for Heschel and the Rambam. In very different ways, both are very preoccupied with creation as a theological category, and a focus on creation obviously opens the door to a more universalistic way of thinking than does an exclusive focus on Exodus or Sinai. Both Heschel and the Rambam begin with the human as opposed to the exclusively Jewish. 3) Do you feel that you are moving Heschel vibrant sense of God’s immanence to a more of a theology of transcendence and covenant? All of this is connected to another fundamental question. 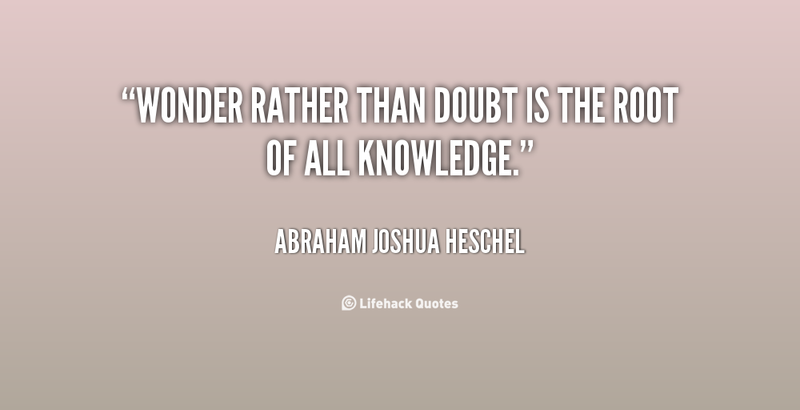 Was Heschel a mystic? If we interpret mysticism expansively to mean the view that human beings are capable of direct encounter with God, then Heschel is definitely a mystic. But if we interpret mysticism in the narrower sense of believing the possibility of true mystical union and the dissolution of the self in God, then Heschel is not only not a mystic, he is an anti-mystic. He is, in this sense, a covenant theologian, not a mystic. I talk about this at length in the book– the self that transcends itself, for Heschel, nevertheless remains a self, separate from but eternally connected to God. (He has no sympathy at all for pantheism or monism, whether popular or philosophical). 4) How do you envision a hypothetical Maimonides- Heschel discussion? One of the things I think mattered to Heschel most was his attack on the way the Rambam talks about God (or, maybe better, makes talking about God impossible). Heschel agrees that theology has to emphasize God’s otherness, but an exclusive focus on divine otherness, such that we can say nothing at all about who God is, leaves us without a God who can be said to care for the oppressed– and this, for Heschel, represents a complete abandonment of the God of the Bible. The fascinating question he raises is: why is it that whenever people think they have achieved synthesis between philosophy and revelation, you look a little closer and you realize that revelation has essentially surrendered to philosophy? At the deepest level there is no give and take. I would put this in the following way: Heschel disputes the notion that one can arrive at a synthesis between scriptural, covenantal religion, on the one hand, and abstract philosophical monotheism on the other. I often imagine Heschel and the Rambam exchanging barbs– the Rambam accuses Heschel of being an idolator (“What do you mean, God cares?”) and Heschel retorts that the Rambam flirts with atheism (a charge Michael Wyschogrod makes more or less explicitly). For the Rambam the enemy was idolatry, and just as Moses shattered external idols, the Rambam will shatter internal pictures of God we have in our mind. For Heschel, in contrast, the enemy is indifference, the disregard of other people’s pain and suffering. I agree with Heschel that the idea that one can fully synthesize Amos and Isaiah with Aristotle or Plato is a fantasy. But at the most fundamental level, I think the question about Heschel’s God– the God of pathos, the God who is outraged and wounded by every act of oppression by the strong against the weak– is not whether it’s Jewishly defensible (that question is much better posed to the Rambam than to Heschel), but whether it’s metaphysically believable in this day and age. 5) Heschel was know for exclaiming things like “Gevalt, prayer is a proof for God” or “prayer is not symbolism but God himself” How does your book develop this theme? First, the idea that prayer is an attempt to de-center the ego, to remember that the self is not the center of the universe. This entails a radical re-orientation: instead of asking how the world can serve me and fulfill my every want, I now begin to ask how I can serve, what God needs me to do in the world. As Heschel puts it at one point, prayer is “the least expedient, the least worldly, the least practical” thing we do. The biggest obstacle to God being present in the world is human selfishness and egocentricity. Not coincidentally, Heschel much prefers prayers of praise to prayers of petition; he is more confident that the former facilitate moments of self-transcendence than the latter. There is another crucial element to Heschel’s vision of prayer: the idea that since God is in exile, prayer is an attempt to bring God back, to open a space in the world where God can dwell. This is what I call the spiritual discipline of enabling immanence, making a space for God in our hearts and, through that, in the world more broadly. 6) What is Heschel’s approach to Halakha? Heschel believed that Halakha is fundamental to Jewish religious life, that it is an essential component of Avodat Hashem. But he was also passionately opposed to what he called pan-Halakhism or religious behaviorism. He insisted that a view of Judaism whereby being religious simply equals observing Halakha is a falsification of the Jewish tradition and is both morally dangerous and religiously bankrupt. There is no Halakha without Aggada (just as, he insists, there is no Aggada without Halakha), or else Halakha is just a set of rules with no larger meaning. The rules have to be about something. But one doesn’t just need a theology; one needs to affirm a God worthy of worship. One can all too easily fall into the trap of worshiping a God who is small-hearted and small-minded. For example, a God who hates all the same people I do (as popular writer Anne Lamott so wonderfully puts it), or a God who does not love the oppressed but is instead used as a bludgeon to hurt them even further (cf. Vayikra Rabbah 32:8). One needs Halakha to be in conversation with a story, a narrative, a set of religious and moral imperatives and aspirations. Nothing Heschel says about this is really new or revolutionary. That Jewish piety requires inwardness– one can start with Rabbenu Bachya; that the cultivation of virtue is fundamental– one should read the Rambam, Ramban, and the history of Musar; and that what God you worship matters. Sometimes I imagine Heschel being inspired the old Hasidic canard about Misnagdim: “A hasid is a yerei shamayim, but a misnaged is a yerei shulkhan arukh.” I can imagine him saying: There is a lot of yirat Shulkhan Arukh nowadays, but how much Yirat Shamayim is there? Implicitly, Heschel says something startling (it seems to me this should be pashut peshat, but it is anything but): you can be medakdek in a million mitzvot and still not have a clue what Avodat Hashem means. Avodat Hashem asks you to observe mitzvot, yes, but also to work on yourself to grow in love and compassion, to care for those who are vulnerable and suffering– just as God does. The Kotzker says that’s the essence of yiddishkeit– arbeitn af zikh. Who talks that way anymore? 7) How is Heschel a critic of materialistic society? Modernity is all about homo faber, the human being who uses the world, who wants to be served rather than stepping forward to serve. The culture of technology blots out the voice of God’s command and the sense that the suffering of the other is my responsibility. Acquisitiveness, possessiveness, etc. are enemies of the spirit, and modernity only amplifies those very problematic impulses. In brief, Heschel thinks that modernity is like acid for the capacity for self-transcendence. In general, he thinks there are two ways of carrying ourselves in the world– he calls them “the way of wonder” and “the way of expediency.” In the way of wonder, I realize that God and other people make a claim on me (probably the sentence he wrote more often than any other is “something is asked of us”), whereas in the way of expediency, I only ask how things and people (and ultimately God) can serve me. I instrumentalize the world and turn into a toolbox for the satisfaction of my own wants (the echoes of Heidegger’s critique of technology are clear). Religion is not just another tool for my own satisfaction. God does not exist to serve me and give me everything I want; rather, God summons me and rips my selfishness to shreds. 8) Why do you think it’s important for Modern Orthodox Jews to read Heschel? I think all Jews who are serious about piety and Avodat Hashem ought to read Heschel, because he lays down the gauntlet in the most powerful way: do you want to serve God? If Torah has not made you more compassionate, more gentle, more able to listen to the sufferings of another human being, then it is not Torah you have learned. About Orthodoxy in particular: there is a tendency in certain circles to think that Halakha is the only thing, so much so that Halakha goes from being a core component of Avodat HaShem to being a kind of idol. Heschel provides a much-needed antidote to that form of spiritual illness and impoverishment. Read Heschel and you are reminded again and again that Rahmana Liba Ba’ei, that God wants the heart, and that religion is about love. Love does not exclude law– ideally, in Judaism, it is thoroughly integrated with it– but law without a focus on love of neighbor and love of stranger is barren and bankrupt, plain and simple. Modern Orthodoxy (or what used to be called that) is atheological– which is not the same thing as atheistic. It’s not that people don’t believe in God, necessarily (though there is no shortage of atheism), but that they don’t think about what that means, don’t engage with the deep questions faith raises, or they engage with theology in a childish manner. There is little meaningful theological discourse to speak of in Orthodoxy, and Heschel’s challenge is scary and threatening to many. 9) What is your next book? I am working on two books. The first is about gratitude and compassion as the two pivots of Jewish spirituality. Along the way, I develop the argument that religion ought to teach us to live with and embrace complexity rather than seeking to dissolve it. The second is an attempt to lay out a theory of human personhood and human dignity from a Jewish perspective, with a focus on what it means to talk about human beings as images of God. What do the Vedas mean in Hinduism? They mean what the tradition interprets them to mean. Originally the meaning was via a philosophy called Mimamsa and in contemporary time it is through Advaita. However, leaders of the faith study both. The original meaning of the vedas according to Mimamsa is a set of procedural ritual laws to follow and that is it. For a follower of Mimamsa, the introduction to your Western paperback edition is wrong. For Mimamsa, the bronze age gods of the Vedas of fire, of wind, of the Sun were already a memory to the first centuries of the CE. Schopenhauer may have found them ennobling and heroic, but the Brahmins did not. The Vedas are an eternal revelation of eternal truths consisting only of rituals to follow. All the stories, gods, metaphysics we don’t understand and don’t bother with. Veda are unauthored, eternal, transcendent and they are called teaching “veda” because they show practical actions of how to live the dharma. According to Mimamsa, we only see what we can perceive. We cannot perceive morality and we have no direct access to morality.The Vedas are our only instrument to know truth and morality. We also have no reason to believe that there ever were exceptional humans who could perceive morality. Meaning that the Rishees (Seers) who receive the vedas were not using human perception, rather they were conduits for the eternal truth. The ceremonial details of the rituals absorb its interest, rather than the gods themselves who gradually recede and fade into mere grammatical datives. A Vedic deity comes to be described not by its moral or intellectual qualities, but as ‘that which is signified, in a sacrificial injunction, by the fourth case-ending’ (the sign of a dative, .to which something is given). In Short, a deity is necessary merely as that in whose name an oblation is to be offered at a sacrifice. But the primary object of performing a sacrifice is not worship : it is not to please any deity. *Nor is it purification of the soul or moral improvement. A ritual is to be performed just because the Vedas commands to perform them. The origins of Mimamsa lie in the scholarly traditions of the final centuries BCE, when the priestly ritualism of Vedic sacrifice was being marginalized by Buddhism and Vedanta. To counteract this challenge, several groups emerged dedicated to demonstrating the validity of the Vedic texts by rigid formulation of rules for their interpretation. The foundational text for the Mīmāṃsā school is the Purva Mīmāṃsā Sutras of Jaimini (ca. 3rd to 1st century BCE). The school gathers momentum in the Gupta period with Śābara, and reaches its apex in the 7th to 8th centuries with Kumārila Bhaṭṭa and Prabhākara. The school was a major force contributing to the decline of Buddhism in India. Vedānta Deśika’s Śeśvara Mīmāṁsā was an attempt to combine the views of the Mīmāṁsā and the Vedānta schools. Human agency is only how one is made into an agent by Vedic injunctive. One trains oneself to desire the right things. Nyaya, similar to Western scholastics, holds that cognition leads to volition and from there to action. Mimamsa cuts out the intellect and volition and holds that desire to action, in which desire means recognition that one has an obligation. If you desire heaven then you sacrifice. Efficacy of ritual is more important than effect on person It also keeps discussions of atman (the self, soul, consciousness) out of the picture. Mimamsa even removes God and Divine agency from the discussion. An agent needs a body, God has no body so God is not a legal agent. Mimamsa has no discussion or place for a personal God since no we have no access to God therefore no legal intention. People used to debate whether Mimamsa is atheist or theist because the law is followed solely because it is the revealed eternal truth without reference to God. From a halakhah point of view, it is similar to keeping all the commands with a knowledge (daat) that the action is a required commandment without a need for any specific intention (kavvanah). According to one early 20th century commentator, the Vedic hymns are inspired by the living presence of the polytheistic deities in the place of worship, Mimamsa loses the living faith in deities. At best, the deities of the Mimamsa are like the immortal characters of classical Epics ; they do not belong to the space-time world; they are not existing parsons, but types. They are more thin characters because they are not the products of any imagination . In contrast, medieval and traditional commentaries actually assume they do not believe them at all. For Mimamsa, according to the great commentary Kumarila, an embodied God is inherently contradictory because how could he be revered by different people in different places simultaneously if he were linked to a body. (Freschi p6 ftnt 10) So for this school and its interpretation of the Vedas, there are no embodied Divine, no incarnations, no physical attributes to God. Everything physical about God can only be from our perspective. To compare halakhah with fiqh or shariah is so 2005, now there is a trend for composing law papers comparing Hindu law and Jewish law. For example, Prof. Donald Davis wrote an article “Before Virtue: Halakhah, Dharmasastra, and what the Law can Create” published in Duke Law Review (2008). Dharmasastra is Hindu law, which Davis thinks is best understood in the categories of Mimamsa. According to Davis, Hindu Law creates the full ideal of what humans were meant to be. Davis finds that Soloveitchik’s Halakhic Man and dharmashatra share this goal of creating the ideal human through law, the ideal halakhic man and the ideal dharmashastra man. Davis points out that for both law and practice of law gives virtue without any prior need for values or aspired to virtue. In both the most important thing is to value the tradition and law is the instrument and embodiment of that conviction of sustaining tradition. The “Theory of Karma” is guided by Mimamsa Philosophy. “Karma” means “deeds”, “act” or “work”. The ‘theory of Karma’ states that good actions produce good fruit, evil actions produce evil fruits. Originally, karma in mimamsa was only based on vedic sacrifice, a ritual that needs to be done – later the term karma was expanded to all of life Mimamsa explain how a human being can achieve the mysterious, transcendent power produced by a correctly performed sacrificial ritual, not through the action of gods. Rather, the merit is only shown after the death of the person performing the ritual. How many of this basic list seem similar to Rabbinics exegetical rules?I think for the third -we do the opposite. Klal uPrat- we follow the prat;they follwo the klal. (1) The Sarthakyata axiom, which means that every word and sentence must have some meaning. (2) The Laghava axiom, which states that that construction which makes the meaning simpler and shorter is to be preferred. (3) The Arthaikatva axiom, which states that a double meaning should not be attached to a word or sentence occurring at one and the same place. (4) The Gunapradhan axiom, which states that if a word or sentence purporting to express a subordinate idea clashes with the principal idea the former must be adjusted to the latter, or must be disregarded altogether. (5) The Samanjasya axiom which states that all attempts should be made at reconciliation of apparently conflicting texts. (6) The Vikalpa axiom, which states that if there is a real and irreconcilable contradiction between two legal rules having equal force, the rule more in accordance with equity and usage should be adopted at one’s option. If you ask almost every trained representative of Hinduism whether Santana Dharma (The Eternal Dharma, Hinduism) is theistic or even monotheistic, you will get a firm yes. They may not like the question as betraying Western concerns but the answer will still be: Yes. Why? This is the second installment of an engagement with Hinduism. Please continue to help me think through these matters. The classical approach to the study of the ancient texts of the Vedas is through the six schools of Indian philosophy, or literally six visions of reality. Almost every trained representative of Hinduism, whether Brahman, Swami or philosophy Professor, accepts the rubric of six Orthodox philosophies. However, it is only Western academics and some Indian social scientists who do not view Hinduism from the point of view of its Orthodox reading. Nyaya deals with logic, evidence, inference, and argumentation. The Nyaya school of philosophical speculation is based on texts known as the Nyaya Sutras, which were written by Aksapada Gautama in the 2nd century CE. Nyaya functions as the logical backbone of Hinduism the way Aristotelianism did for more than a millennium in the West. Today, university students write on topics like Nyaya and analytic philosophy, Nyaya and Aristotle, Nyaya and Habermas. Julius Guttmann in his grand work Philosophy of Judaism saw Saadyah’s 10th century interlocutors as including the Brahmins and their schools of philosophy. Indian Philosophy used to be taught as an elective at Columbia and CCNY, so it could be discussed in comparison, Now, if anyone takes Aristotle you are lucky. In addition, Indian philosophy has moved to the more ethnographic religion department, the same way much of the study of Judaism has migrated from philosophy and history to Jewish Studies. According to the Nyaya school, there are exactly four sources of knowledge (pramāṇas): perception, inference, comparison, and testimony. Very similar to Saadyah’s four sources of knowledge. The major difference between Saadyah’s arguments and Nyaya is that the latter assume that God created the world from eternal matter. However, Nyaya differs from Aristotelian logic in that it is more than logic in its own right. Its followers believed that obtaining valid knowledge was the only way to obtain release from suffering. This offers us an insight into how Saadyah and Maimonides thought philosophy was needed to obtain the world-to-come. Early Naiyayikas wrote very little about Ishvara (God, the Supreme Soul). However, when later Buddhists in India became strictly atheistic, the later Naiyayikas entered into disputes with the Buddhists and tried to prove the existence of God on the basis of inference. They also increased the attributes of God from just knowledge and volition to a wider list of attributes including providence and beneficence.. Yogic texts, in contrast, have God as an object of contemplation and perfection but not for causality and providence. Udayana’s Nyayakusumanjali gave the following nine arguments to prove the existence of creative God. Here are four familiar to a Jewish audience from Saadyah. Cosmological argument – Kāryāt (lit. “from effect”): An effect is produced by a cause, and similarly, the universe must also have a cause. The active cause of the world must have an absolute knowledge of all the material of creation, and hence it must be God. Hence from the creation, the existence of the Creator is proved. Composite nature of the world– Āyojanāt (lit., from combination): Atoms are inactive and properties are unphysical. So it must be God who creates the world with his will by causing the atoms to join. There is to be seen the hand of a wise organizer behind the systematic grouping of the ultimate atoms into dyads and molecules. That final organizer is God. Faith in Scripture — Pratyayataḥ (lit, from faith): the Hindu holy scriptures, the Vedas, are regarded as the source of eternal knowledge. Their knowledge is free from fallacies and are widely believed as a source of proof. Their authors cannot be human beings because human knowledge is limited. Hence, only God can be the creator of the Vedas. Hence, his existence is proved from his being the author of the Vedas, which he revealed to various sages over a period of time. Moral Argument – Vākyāt (lit., from precepts): World is governed by moral laws that are objective and universal. Hence there exists God, the promulgator of these laws. On monotheism— the Naiyayikas have also provided arguments such a God can only be one monotheistic God . We cannot assume there were many gods (Devas) and sages (rishis) in the beginning, who wrote the Vedas and created the world. This is because the law of parsimony bids us assume only one such, namely Him, the adorable Lord. There can be no confidence in a non-eternal and non omniscient being, and hence it follows that according to the system which rejects God, the tradition of the Veda is simultaneously overthrown; there is no other way open.In other words, Udayana says that the polytheist would have to give elaborate proofs for the existence and origin of his several celestial spirits, none of which would be logical. So it is much more logical to assume only one, eternal and omniscient God. So polytheism and a multiplicity of gods make no sense in Orthodox Indian philosophy, even if the American ethnographic studies differ. Nyaya accepts the reality of yogic perception of a direct intuition from a concentration of the mind on the authority of the vedas. Here there is an opening for a discussion of direct intuition in Saadyah. If I remember correctly, Moise Ventura and Israel Efros denied such an intuition in Sadyah but Abraham Joshua Heschel in his article on Quest for Certainty in Saadyah thinks the medieval thinker allows direct intuitions. Nyaya has some useful discussion of doubt that can help elucidate Norman Lamm’s concept of provisional or methodological doubt in Saadyah in his article “Faith and Doubt”. They acknowledge that sometimes there is conflicting evidence. Samsaya or doubt is a state of uncertainty. It represents the mind’s wavering between different conflicting views with regard to the same object. Doubt arises when with regard to the same thing there is the suggestion of different alternative views but no definite cognition of any differentia to decide between them. Doubt is not certain knowledge, nor is it the mere absence of knowledge, nor is it an error. It is a positive state of cognition of mutually exclusive characters in the same thing at the same time. Nyaya also characterizes arguments better than Monty Python and more useful for text study- here is a sample. Jalpa is mere wrangling in which the parties aim only at victory over each other, but do not make an honest attempt to come to truth. Vitanda is a kind of debate in which the opponent doo8 not establish his own position but only tries to refute that of the exponent. Chaia is a kind of quibble in which an attempt is made to contradict a statement by taking it in a sense other than the intended one in order to deflect an argument. Karma is which one’s actions lead to future action gets a theistic reading in Nyaya, in that God as a wise and benevolent father directs his son to do certain things, according to his gifts, capacities and previous attainments, so God directs all living beings to do such actions and feel such natural consequences thereof as are consistent with their past conduct and character. Thus God is the moral governor of the world of living beings including ourselves, the impartial dispenser of the fruits of our actions, and the supreme arbiter of our joys and sorrows. Nyaya is accepted by Vedanta especially Shankara’s Advita as a first step. Some schools of Vedanta such as TM consider that they has transcended the philosophical position of the Nyaya. On the other hand, the strongly theistic non-Advitan approach of Ramanuja has reservations on the rather scholastic first cause theism of Nyaya. Instead, Ramanuja, like Azriel of Gerona or Ramhal, has an image of the Divine as needing to shower the world with His own goodness and blessing. So whereas, Nyaya like many rational thinkers postulates that God creates to show his majesty and glory, Ramanuja has God create to shower blessings. But those American ethnographers with their recording devices collect stories from common folk, without this scholastic training, and say that in Hinduism that God creates as a sport, as the creative activity of the Divine called lila. The world is seen as the stage of the divine play, in which Brahman is the great magician who transforms himself into the world and then performs this feat with his “magic creative power”. For those who want more, John Vattanky, Is Theism Central to Nyaya?